Hi everyone, I was also able to do some long-awaited improvements since we were pushing out a bunch more updates and were needing some more stability again. One of the first things I did was wanting to reduce the server-side load. Until now colonies even if their player is not around, we're still partially ticking every tick (20 ticks per second) which was causing some lag on servers with a few hundred colonies. 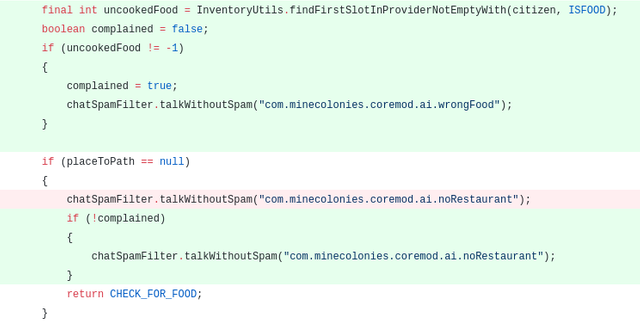 For that reason, I added in the server and world tick method of the colony as the first method call the detection of "subscribers" of the colony and would then not tick at all if no player is around. After that, I added an active check in the colony. Which I would update if the colony would tick following the rule I previously implemented. The colony would until now write itself to file every time we store the list of colonies. But this is wasting a lot of programming time since the colony didn't change at all. So we cache as previously the byte data and only write it if it is actually active or not existent. And would then, when writing the colony just return the cached version. A small fix I did also was that our structure builders would crash if they would run in the pickup mode after finalizing a structure and then reloading, so I added a safeguard. 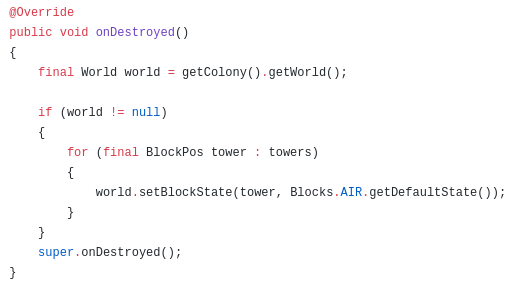 Besides that, I added that builders finally accept existing entities in the world and only buildings them if they don't exist yet. * Checks if a certain entity is in the world at a certain position already. * @param entity the entity. * @param world  the world. * @return true if there. 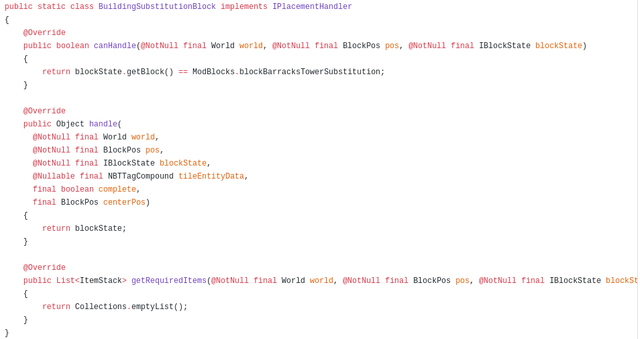 So that, when we try to place entities we verify if there is not a similar entity there yet. Similarly, when getting the required stacks for a build we would also do that. Something which always bothered our structure builders was that when they used to build the barracks they had to be oddly specific with the placement of the tower block since it had a fixed difference. To go around this limitation I created the barracks tower substitution block which they can now place in the schematic and it will serve as a source of rotation and location of the tower. So the barracks building now stores the position of the tower. It would get these on registering the block position when the builder builds the building. 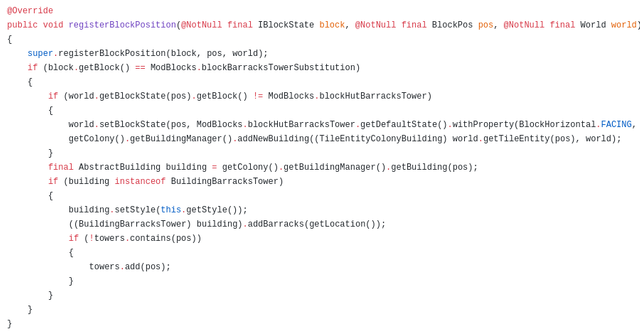 Int his case we would check if the block is a barracks tower substitution block and if so replace it with a real barracks tower block with the correct rotation, assign it to this barrack and add it to the list. So that we, on destroy are able to clean the positions up. First of all, I added that the builder won't require that block to build the building. By adding its own placement handler. Also, I changed that replacement blocks in the desert are sandstone and not dirt anymore. Also made the feeding people only eat cooked food since that is more efficient and would complain if they only had uncooked food. Also, I added that we now tell the player specifically which job the citizen had that died. Besides that I allowed the sawmill worker (Crafter) to craft our own shingles as well. 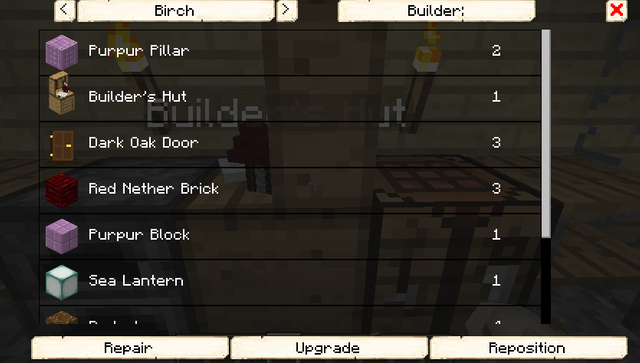 Finally, I did some clean up in the hut build GUI. In the hut build GUI, I changed the cancel button for repair. And added the cancel button as a black X in the top right corner. Which allows me to declutter the main GUI. So I had to move the repair clicked method into this GUI class, allowing to assign a specific builder to it. So where previously were two buttons, one for repair and one for building, the GUI only has one which makes it lay less cluttered. Besides that in the building options GUI we got now only one small X button more but are now able to assign a builder specifically to a repair as well. Many of these things were requested for a long time but didn't make their way up to the queue yet. 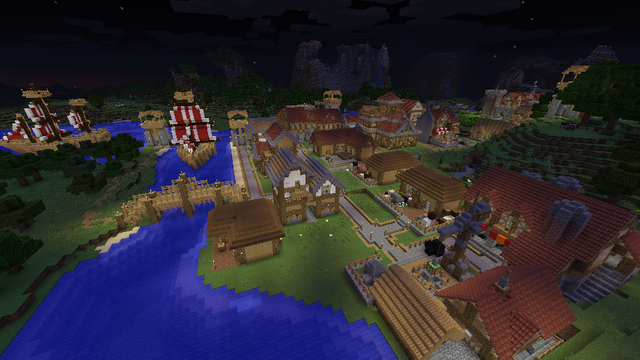 Now that the crafters are starting to flow we are able to add a bunch of things of our big backlog to the game. Great article, and we got more images! Code is awesome as always. Ein kleiner Testbot, dem dein Beitrag gefällt und dir ein Upvote da lässt. Vielleicht freust dich ja drüber. You just got a 8.69% upvote from SteemPlus!